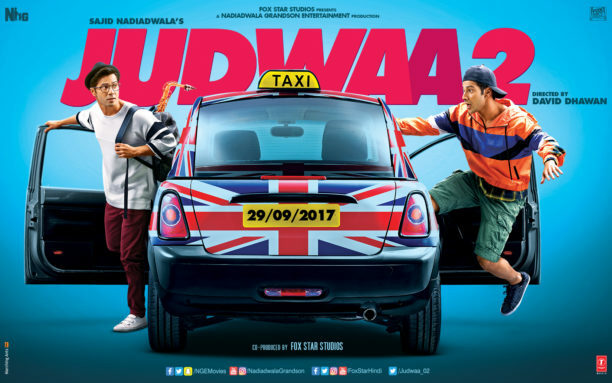 Check it out we have a first look at David Dhawan’s Judwaa 2, which stars Varun Dhawan, Jacqueline Fernandez and Taapsee Pannu. Released on his 65th bday this is David Dhawan’s 43rd film. This is a sequal to the 1997 orginal Judwaa which starred Salman Khan, Karishma Kapoor and Rambha. Get ready for RAJA and PREM Double fun this Dussehra! This is just to tease you until the trailer hits on August 21st! We look forward to seeing Varun take on this cool character! Presented by Fox Star Studios and Nadiadwala Grandson Entertainment Pvt. Ltd. and produced by Sajid Nadiadwala, Judwaa 2 is slated to release on September 29th, 2017.